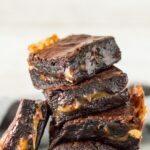 Nutty Caramel Brownies – Deliciously thick and fudgy chocolate brownies filled with a caramel layer that is loaded with peanuts. Ooey gooey brownie goodness! Guys, I think I’ve just made my new favourite brownie recipe! 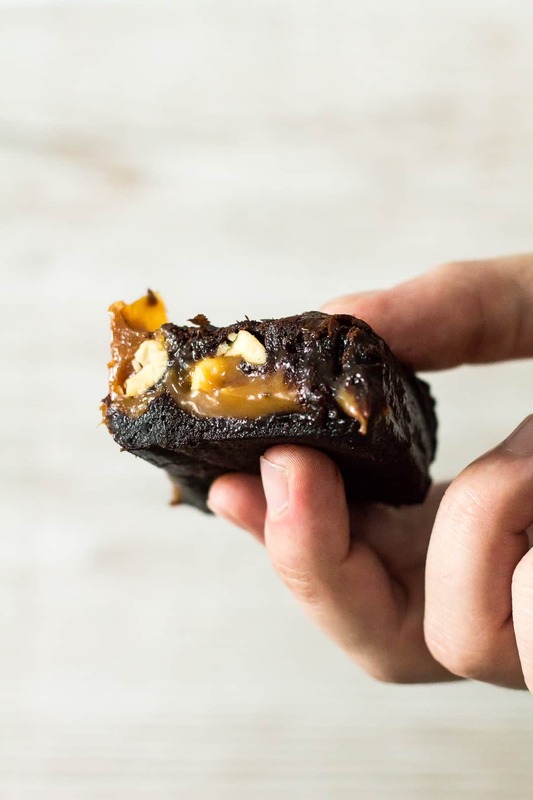 These brownies are thick and fudgy, and are filled with a gooey caramel centre. The caramel layer is also stuffed full of salted peanuts which gives these brownies extra crunch. What more could you want out of an indulgent brownie recipe? To make the brownies, simply add the butter, sugar, cocoa powder, and salt to a microwave-safe bowl. Heat for 1 minute, then stir to combine. Heat for another minute until the mixture is very warm to the touch. Mix in the eggs and the vanilla until fully combined, then fold in the flour. Fold in the chocolate chips, being sure not to let them fully melt into the batter. Spoon half of the batter into an 8×8-inch square baking pan lined with foil or parchment paper and spread out evenly. For the caramel centre, add the caramels and milk to a microwave-safe bowl, and heat in 30 second intervals, stirring after each one, until melted and smooth. Allow the caramel to cool slightly and thicken up in the fridge – about 20 – 30 minutes. Fold in the chopped nuts, and spread the caramel evenly over the brownie batter. Top with the remaining batter. Bake for 30 – 35 minutes. The centre will still be jiggly, but will firm up as the caramel layer cools. Allow to cool completely in the fridge or freezer before cutting into bars. a perfect chocolatey indulgent treat! 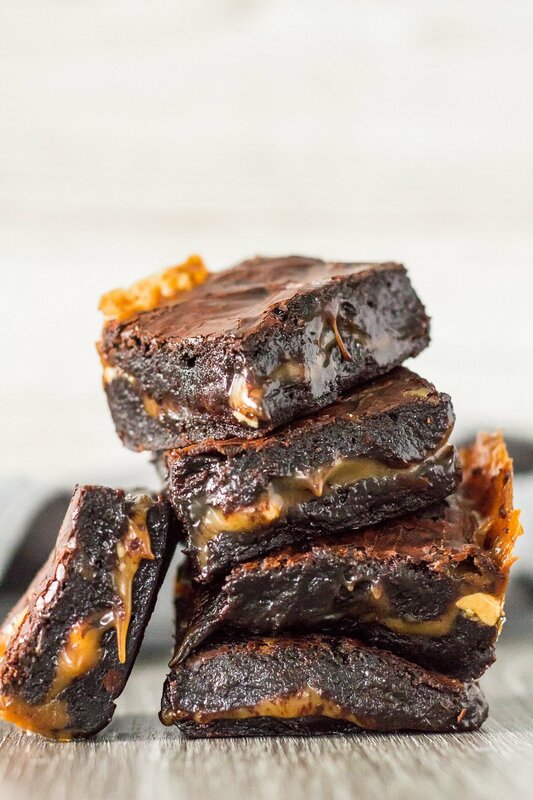 How long will these caramel brownies last? These brownies will stay fresh stored in an airtight container in the fridge for up to 1 week. I do not recommend storing these at room temperature as they will become too soft. 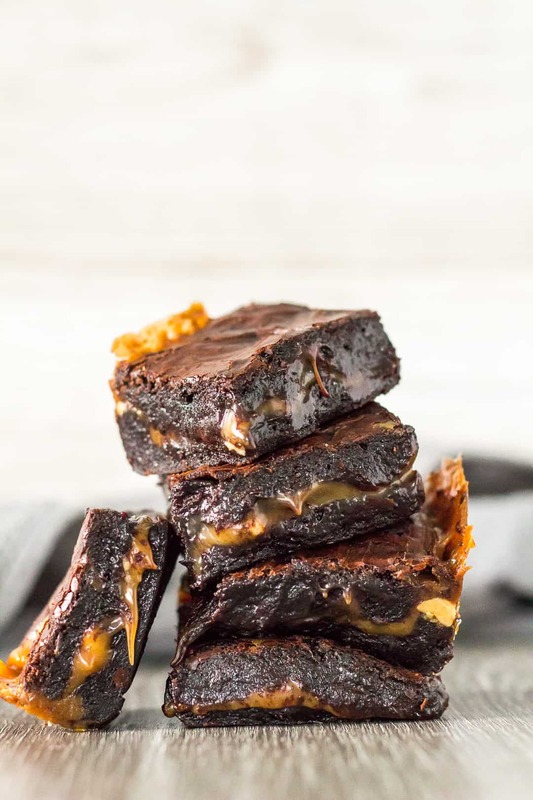 Can I freeze these caramel brownies? Yep! These brownies freeze well for up to 3 months. Thaw overnight in the fridge before serving. Deliciously thick and fudgy chocolate brownies filled with a caramel layer that is loaded with peanuts. Ooey gooey brownie goodness! Place the butter, sugar, cocoa powder, and salt into a microwave-safe bowl. Heat for 1 minute, then stir to combine. Heat for another minute until the mixture is very warm/hot to the touch. Mix in the eggs and vanilla until fully combined, then fold in the flour. Fold in the chocolate chips, being sure not to let them fully melt into the batter. Spoon half of the batter into the prepared pan and spread out evenly. Place the caramels and milk in a microwave-safe bowl, and heat in 30 second intervals, stirring after each one, until melted and smooth. Allow to cool slightly and thicken up in the fridge - about 20 - 30 minutes. Fold in the peanuts. Spread the caramel evenly over the brownie batter, then top with the remaining batter. Bake for 30 - 35 minutes. The centre will still be jiggly, but will firm up as the caramel layer cools. Allow to cool completely in the fridge or freezer before cutting into bars. Brownies stay fresh stored in an airtight container in the fridge for up to 1 week. They also freeze well for up to 3 months. Thaw overnight in the fridge before serving. These pictures make me want to lick my screen! Yum!!! These brownies are amazing! 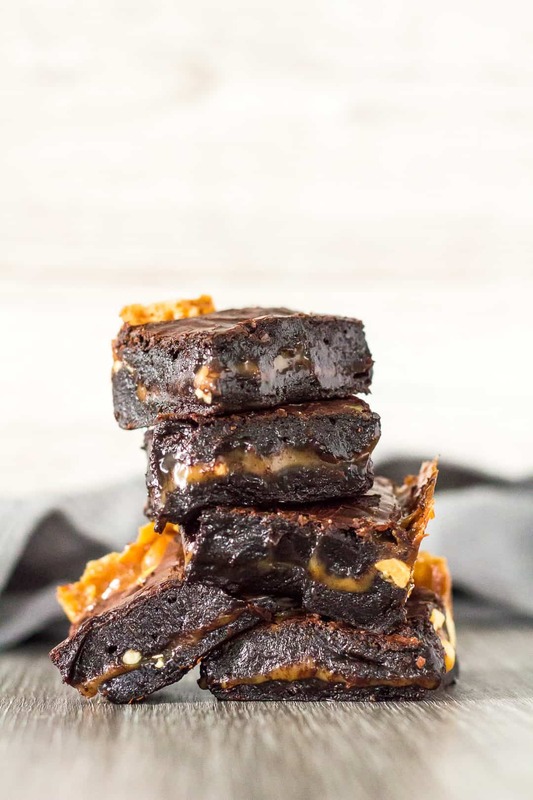 There’s nothing I enjoy more than warm, gooey, chocolate brownies but once you add caramel and nuts? OMG. Heavenly. Holy cannoli Marsha! I can’t come to your site because I always want to eat everything I see. These brownies are no exception. I just looooooooooooove caramel (can you tell I like caramel??!!). . .and then you had to weave it into an ooey gooey brownie!!! Stop! !